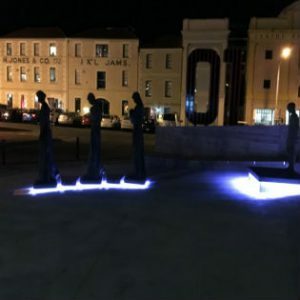 It was an historic event – the unveiling of the sculptures representing the 12,500 women convicts and 2,500 children who came to Van Diemen’s Land in the early to mid-1800s – which commemorated another series of events… the transportation in misery of women and children to the penal colony in Van Diemen’s Land. As the sculptures were unveiled at MACq01 wharf just above Hunter Island where these women would have first stepped ashore, I related viscerally and emotionally to our early Sisters ministering with these women and children who had endured unspeakable hardships. Irish sculptor, Rowan Gillespie, modelled these sculptures on descendants of these women and children. He said: “I live with them and I have this thing that I really believe that I know them as the process happens, so you get very emotional.” I was touched by how he had poured his heart and soul into the making of these sculptures. 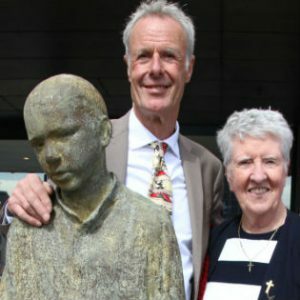 He spent time in Hobart listening to the stories of descendants of convicts, visiting the archives and then returning to Ireland to his workshop with 3D scans of the models and going through the arduous task of moulding these “women and child,’ in bronze. On Sunday, we held our own RSC liturgy around the sculptures, then went up to celebrate Eucharist at St Joseph’s Church just as the first three sisters, John Cahill, Catherine O’Brien and Xavier Williams did upon their arrival in Hobart Town in June, 1847. After a celebratory lunch, we continued our liturgy around the deceased sisters’ graves at Cornelian Bay, placing the roses from the previous liturgies on them as we prayed with and recalled their names. Sharing these historic events, liturgies, and prayers with 21 other sisters added greatly to the spirit especially with the welcome and enthusiasm of our Congregational Leader, Clare Nolan, and the committee of sisters including Anne Turner (our one sister resident in Tasmania who organised the liturgies and transportation). Michael Higgins’ inspiring speech can be accessed here. 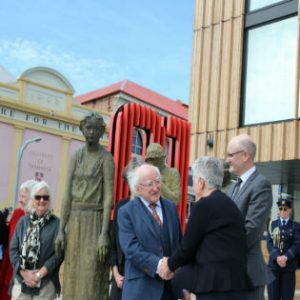 Irish president helps unveil convict sculptures in Hobart appeared on line from The Mercury. Here is the link to The Mercury story.